The new Matrox Axio family of realtime HD and SD editing platforms is designed to give you the highest finishing quality coupled with the most comprehensive realtime feature set at an affordable price point. Matrox Axio makes Adobe Premiere Pro the foremost realtime HD and SD editor for demanding broadcast and post-production environments. It features no-render HD and SD finishing in compressed and uncompressed formats, superior color correction tools, advanced realtime effects, and a full range of analog and digital audio and video inputs and outputs. Matrox Axio makes Adobe Premiere Pro the foremost realtime HD and SD editor for demanding broadcast and postproduction environments. It features no-render HD and SD finishing in compressed and uncompressed formats, superior color correction tools, advanced realtime effects, and a full range of analog and digital audio and video inputs and outputs. It incorporates Matrox Flex 3D and Power of X technologies to leverage scalable CPU power with the explosive performance of dedicated 3D graphics hardware to provide the ultimate SD and HD editing environment. The Matrox Axio family builds on solid expertise gained over several generations of Matrox DigiSuite and RT Series products. 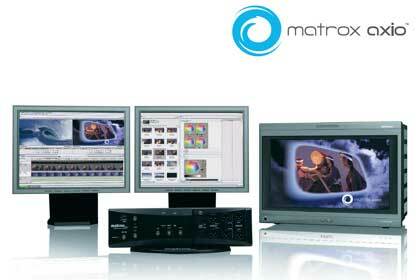 Well over 200,000 users worldwide currently enjoy the amazing value, stable reliability, and superior productivity of Matrox-based realtime nonlinear editing systems. Close collaboration between the Matrox and Adobe engineering teams throughout development ensure the tightest hardware/software integration.